Thanks to Pinnacle® Vodka for sponsoring this post and helping to make entertaining friends and personal R&R a delightful occasion. Sometimes a girls' night in is absolutely necessary. And a themed soirée is a great time to practice entertaining in style. Put on your hostess hat and assemble a quick and easy movie night for you and your favorite girlfriend while the hubs take the kids trick-or-treating. And just because a mom’s work is never done, throwing together a soirée for friends needs to be simple yet welcoming. Set the ambiance using a fall-inspired tablecloth as the backdrop with a textured runner and Halloween-inspired décor. Of course, it wouldn’t be movie night without popcorn, so toss some into the microwave. 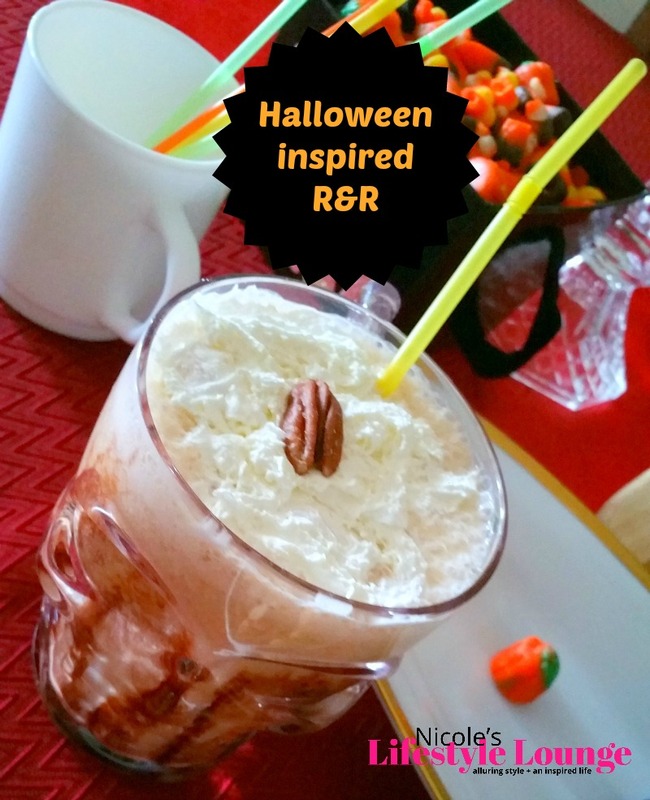 Open a can of trail mix, pop open a bag of autumn-mix candy, concoct a serious decadent cocktail, and viola!—a lovely Halloween-inspired movie night for moms getting some much-needed downtime, all put together in less than 10 minutes. Keep this blended beverage alcohol-free for a party with the kiddies. The kid-friendly version of this milkshake was a big hit with my two-and-a-half-year-old—she loved it! Blend orange juice, milk, and frozen bananas in a blender until smooth. Then add ice and pecan pie–flavored Pinnacle® Vodka and blend until frothy. Drizzle chocolate syrup into glasses (I used skull mugs for a spookier effect). Pour mixture from blender into glasses. Jazz it up with whipped cream and add a pecan on top to serve. Pinnacle Vodka shakes things up with unexpected experiences and delightful discoveries. Explore with other fun flavors at http://www.pinnaclevodka.com. Pinnacle®is a registered trademark of Jim Beam Brands Co., and is used with permission. This is a sponsored partnership with Pinnacle® Vodka, via Mode Media. The information, comments, and ideas expressed on this website are those of the author and do not necessarily reflect the opinions or positions of Jim Beam Brands Co., its affiliated companies, or any of its directors or employees.